As soon as the bright yellow electrical poles go up and down Main Street, we know it can only mean one thing, Old Settlers is here! 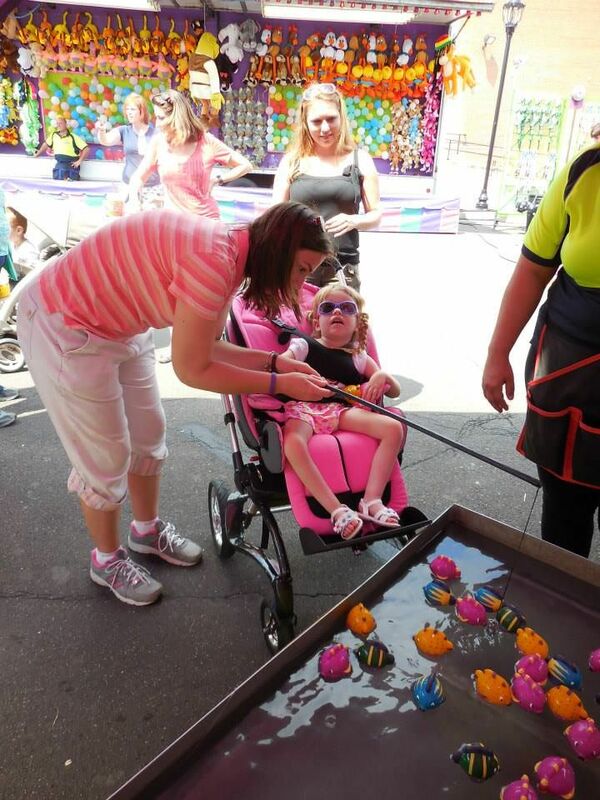 Our Dorothy had a great time at this year's Old Settlers celebration! And while another Old Settlers celebration has come and gone, it was fun to participate in our town's celebration this year. It started on Sunday with one of our very favorite events, the community church service. It's held only a block from our house, so we walked with Grace in her new Stingray stroller to the service with area residents from all denominations. It's one of my very favorite services of the entire year. I also get to participate in the service by reading the memorial prayer of those who died in the past year. It was something started by my grandparents, and a way I can carry on their tradition. Grace is all smiles winning a second place ribbon in the ponytail and pigtail contest! 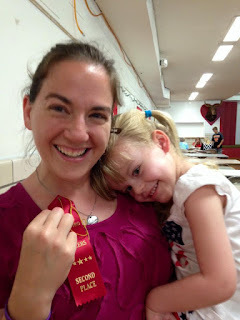 Grace had the chance to earn two ribbons at this year's Country Fair on Sunday. We entered one of her photos in the baby photo contest, and her three-year-old photos won a third place ribbon! Then she got a second place ribbon for have 13.5-inch pigtails! It's another of our favorite contests, because it's something Grace can participate in. Last year, we also made a homemade apple pie for the household science exhibit, and Grace loved playing in the flour, but we just didn't get that done this year. 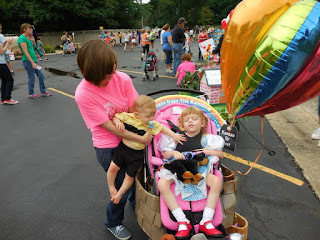 There's no place like home at this year's Kiddie Parade. After taking a few days rest, the celebration continued on Wednesday evening and Thursday. And Kyle and I put a lot of hard work into getting ready for Thursday morning's Kiddie Parade. Not only is it something I have fond memories of doing each year when I was a child, but we have made a mini float for Grace each year too. It always takes us awhile to agree on an idea. One year the theme was "Oh, the Places You Will Go," and Kyle wanted to do "To Jail." I vetoed that idea, and we did a China-inspired float instead. Lincoln was Charlie Brown in this year's parade!! 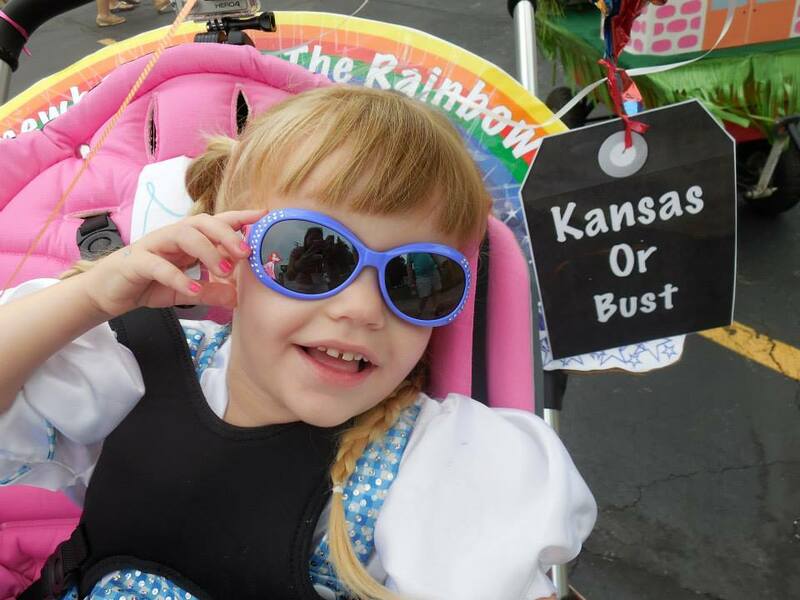 This year's theme was super fun, "Storybooks Come to Life," and it didn't take us long to agree on "The Wizard of Oz." 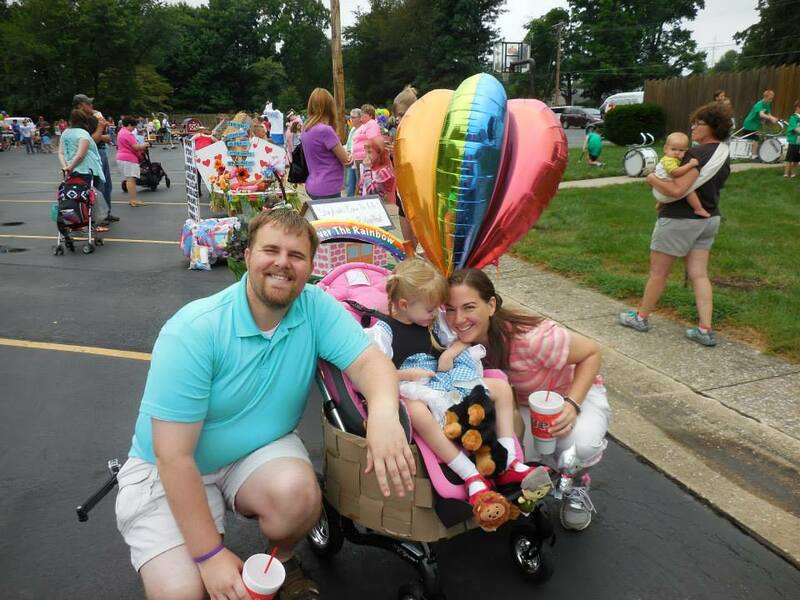 We decided to wait until Grace's new Stingray stroller came, and we transformed it into a hot air balloon. Grace wore a Dorothy costume that we borrowed from her preschool teacher. Kyle even mounted our new GoPro camera to the stroller to get a "Grace-Eye" view of the parade! 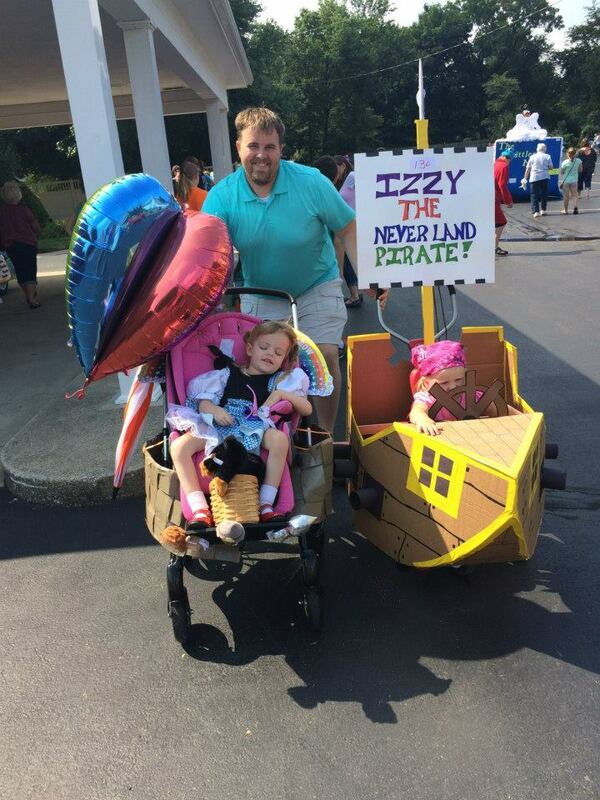 Cousin Izzy was a pirate in the parade! She's trying to get away from Kyle in this photo. Entries were up this year, and Grace won sixth place in the mini floats category. We always just participate for fun, so winning a place is just a bonus for us. And we love seeing all the entries people put so much time and work into. Grace won a princess crown at the fishing game! 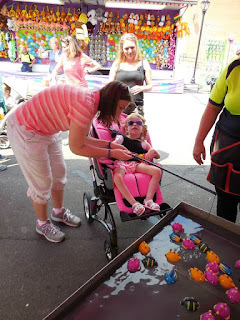 After the parade, we walked around uptown, and Grace got to place a fishing game and take two rides down the big slide. 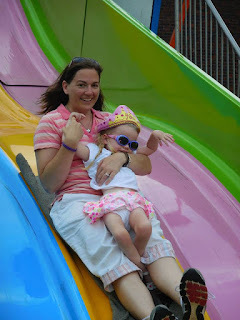 She loved every minute, which made the incredibly LONG climb to the top worth it for this mom. 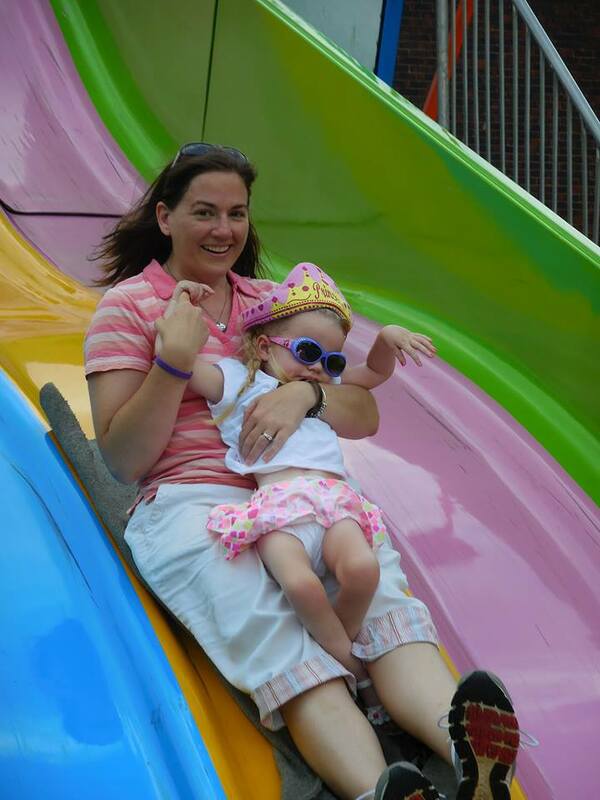 Taking our turn down the BIG slide! 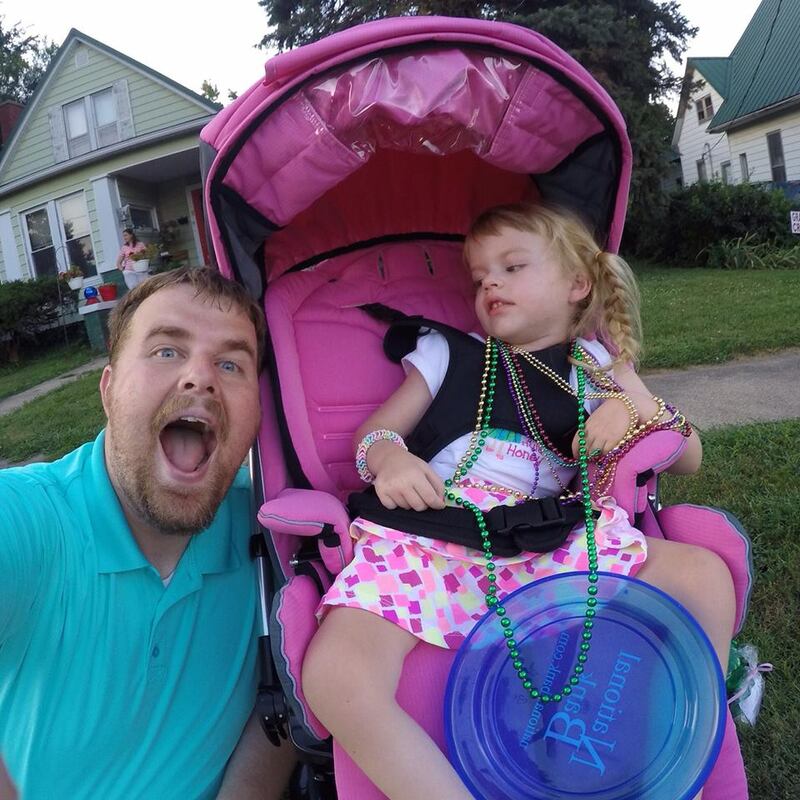 Then, Grace and daddy went home for an afternoon nap, and joined me back uptown to take some candids at the big parade and watch it as it went by. 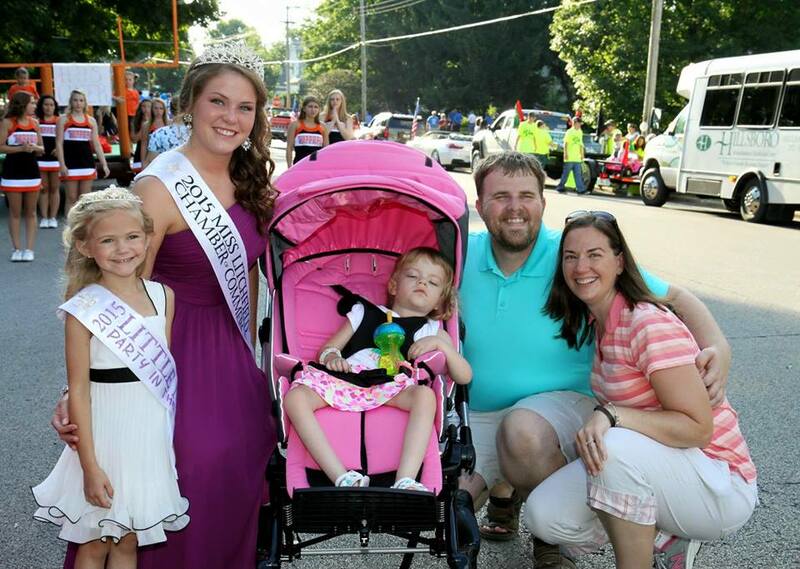 We had a chance to hobnob with some of our favorite fair royalty, Miss Chamber of Commerce Natalie Elliott and Old Settlers Queen Alanna Bader, who gave Grace one of her roses. Hanging out with Litchfield royalty! We know that good things always have to come to an end, and we thoroughly enjoyed this year's Old Settlers celebration. Can't wait for next year! Watching the Big Parade with Kyle and collecting necklaces.